The official unit of measurement for cane spiders is the tuna can as in, ‘that spider is the size of a tuna can.’ In the case of this particular cane spider that statement is true – the trim it’s resting on is a 1×4. 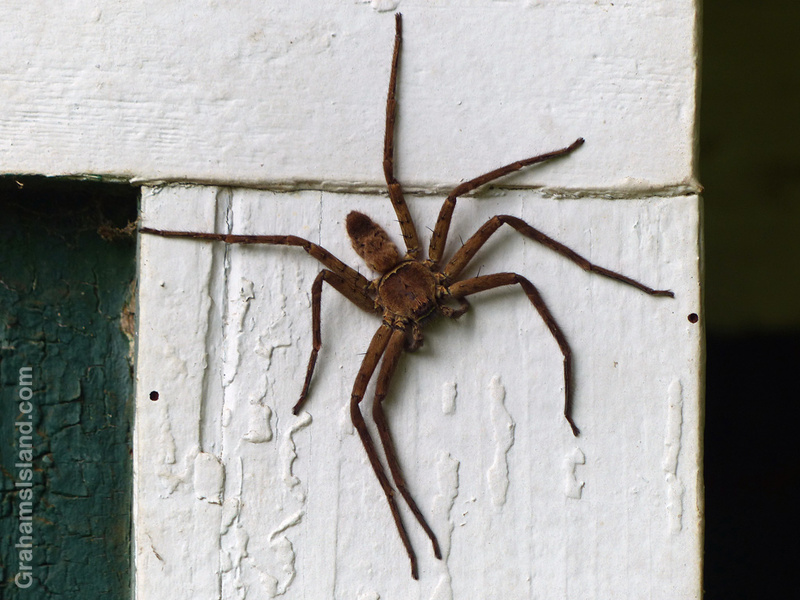 While large, cane spiders aren’t particularly aggressive. If threatened, they prefer to run off – and they are fast. If one does bite, it can inject venom, but it isn’t considered dangerous. On the plus side, cane spiders are hunters and include cockroaches amongst their prey. While I heartily endorse this activity, it’s a bit much for me to have a mobile, hairy tuna can scurrying around the house and leaping out at inappropriate moments. The first time I saw a cane spider was while reading in bed, which was startling to say the least. There then followed a merry chase, involving moving furniture, before I was able to trap the beast and release it outside. That’s where I prefer to see them and I was happy to see this one on the side of the house. It stayed in this spot for quite a while until one time I went to look again and it was gone. At that point, the trick is to carry on as usual and not start wondering whether it followed me inside after the last time I saw it.